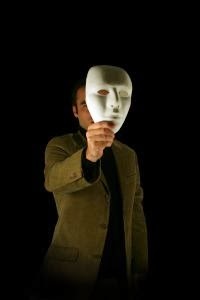 Take off that mask – and be yourself! Stop living your Life for others. Do what you must do in a situation not what “you” believe society wants you to do. My movie star friend’s story is not an exception. While, in his case, it may be a lavish lifestyle, funded by debt, that he maintains to “look good” in front of his fans and society, each of us seeks social approval and works, often in vain, for it – in our own unique ways. If we think about it deeply, when we live – in any context – for the sake of others’ opinions of what is right or wrong, what is good or bad, we suffer. This is because we are going against what we personally prefer, want and enjoy – and we live wearing a mask. That mask, always, hurts. The truth is that society really does not demand that you wear that mask or veil. It is you who think, imagine, believe that these, often unstated, social norms must be adhered to. There’s a subconscious conditioning that has happened to you, as you have grown in your career, and your Life, that you must be this way or you must be that way. Nobody told you anything specifically. But you just imagined it to be so. And, of course, some people can be uncharitable and obnoxiously remind you if you are not following social norms. We were once invited to a banquet in a 7-star hotel. Many of the other guests were good friends – all of them successful business people, professionals, actors and sports stars. Many also knew of our financial state – our bankruptcy. One of the guests did not hide his surprise at seeing us there. “‘Aap, yahan?’ – You, here?” – he asked. “‘Haan. Aane ki to aukad nahin hai, lekin aaye hain kyonki bulaye gaye hain’! – Yes, we don’t have the social standing to be here. But we are here because we have been invited!” – I replied with a beaming smile. In any situation in Life, choosing to be yourself, unmasking yourself, is the best thing to do. Nothing wrong in being nice and wanting to please others or “look good” in front of them – but the key is, are you “feeling good”, are you doing what’s right and important for you? Choosing to be yourself may well cause a few ripples in the external situation that you may be placed in. But will give you great inner peace. Now, making that choice is a personal call, and a no-brainer, right? Author AVIS ViswanathanPosted on February 6, 2014 March 14, 2016 Categories Art of Living, Be Yourself, http://schemas.google.com/blogger/2008/kind#post, Inner Peace, Intelligent Living, Unmask, VeilLeave a comment on Take off that mask – and be yourself!